Ada pertanyaan untuk Eden Resort? Jika apa yang Anda cari adalah hotel yang terletak strategis di Cebu, carilah Eden Resort. Pusat kota terletak hanya sekitar 137.0 km dan bandara dapat ditempuh dalam waktu 180 menit. Dengan adanya obyek wisata utama kota ini seperti Oslob Whale Shark Watching yang sangat dekat, pengunjung akan sangat menyukai lokasi hotel ini. Di Eden Resort, pelayanan istimewa dan fasilitas yang unggul akan membuat pengalaman menginap Anda tidak terlupakan. Fasilitas terbaik hotel ini termasuk satpam 24 jam, layanan kebersihan harian, toko oleh-oleh/cinderamata, layanan taksi, resepsionis 24 jam. Hotel ini memiliki 10 kamar yang didesain dengan indah. Banyak kamar memiliki televisi layar datar, kamar mandi tambahan, toilet tambahan, linen, cermin. Daftar lengkap fasilitas rekreasi tersedia di hotel termasuk hot tub, pantai pribadi, kolam renang luar ruangan, menyelam, spa. Eden Resort adalah pilihan yang cerdas bagi para wisatawan yang berada di Cebu dan menawarkan pengalaman menginap yang menenangkan setiap saat. Usia minimum tamu: 15 tahun. This is my 5th visit over as many years and the place never disappoints. The view across the sea to Negros is as awesome at night as day. They have retained their loyal staff such as Luz and June who wrote the book on customer service. Each visit has shown ongoing investment in improvements in the buildings which is necessary for the long term. I was shocked to see a little oasis in the middle of southern Cebu. 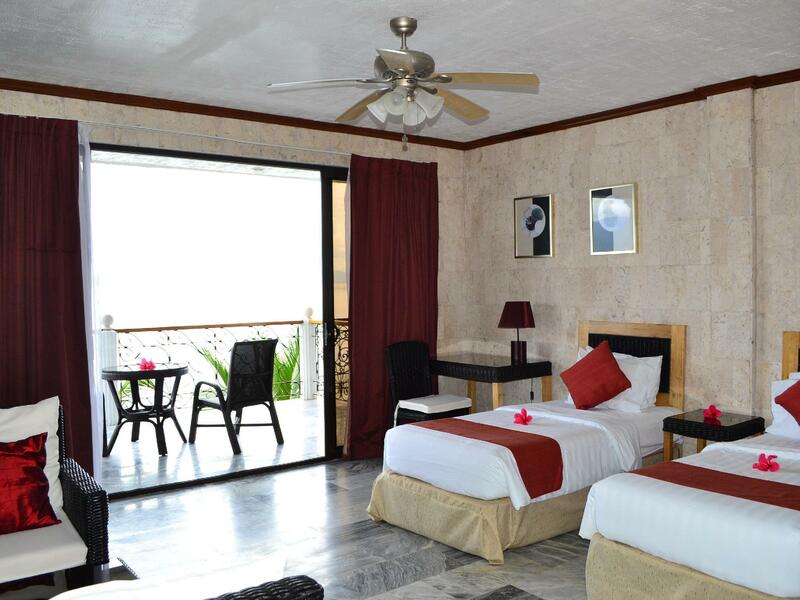 Each room has it's own incredible view with a terrace overlooking the mountains of the neighboring island and the ocean. Being American, there were great choices of food to eat at the restaurant. The infinity pool was salt water and amazing. There is a cool breeze in that location as it overlooks the ocean, so it wasn't too hot. The massages and pedicures are SO reasonably priced. Loved the complimentary American breakfast that they will bring to your room to eat outside on your terrace. It's only about a 20 min. tricycle ride to Oslob whale sharks, The staff will book tricycles ahead for early mornings. My only negative was the water pressure was low in the shower, but the hot water still worked great. There are limited number of rooms, so I loved the small and non-commercial feel. Just returned from a 2 night stay to view whale sharks. 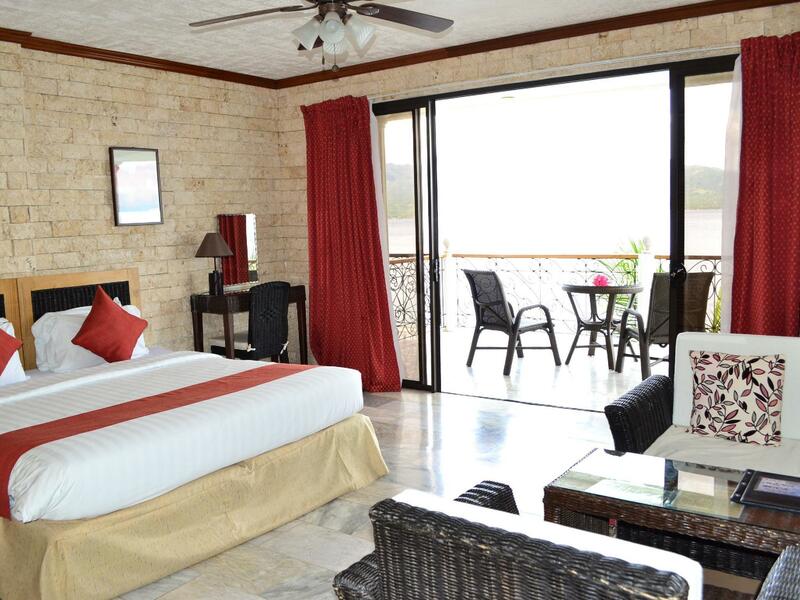 Magnificent,clean rooms with fantastic views over the water. A 5 minute walk from the ferry port,so need for a transfer. Food and drink very cheap at the resort, however most food needs a bit of improvement. Ingredients in dishes are obviously just a suggestion! Drinks are great though. 20 minute trike ride from Whaleshark viewing, about 400 peso return. Lovely massages at the spa for 480 peso also. Make sure you go in good weather as there’s not much to do in the area if it’s raining. Location is perfect to explore all around. 5 minutes walk from the piers. Restaurant serve every day something new and always very tasty. Staff and personnal are very helpfull. Snorkling teacher is very professional and give the best advice to explore this area. This place was for us....The Eden. We will come back for sure! We loved Eden Resort! It is located in a quiet town in South Cebu and the grounds were well-kept and clean. The food was delicious, our room was spectacular, and the staff was friendly. We cannot wait to go back again soon! This is the 4th occasion I have stayed at Eden and will continue to stop there when visiting southern Cebu. The staff have not changed is many years and are reliable and dependable. (Jenny, Luz, Junis Lavonne etc) Safe location and quiet with magnificent views across to Negros. Our room was fantastic with a lot of space. The balcony and views were exceptional. The infinity pool is great and sitting in the outdoor undercover bar/restaurant looking out at the view of the water and over to Dumagette was breathtaking. The lady who works in the afternoon who has been there for about 10 years deserves a special mention. She was very lovely. We went to see the Whale Sharks one morning and a jeepney driver picked us up and drove the 15mins to Oslob. The ferry terminal to Dumagette is an easy 5 min walk down the road. 20 mins on a ferry and you are at Dumagette. We wished all of our accommodation was as beautiful as Eden resort. Yet another enjoyable stay at Eden. One initiative that had been introduced this time around, was a limit switch on the sliding door to the balcony with the switch interconnected to the air conditioning. The A/C was turned off if this large door was left open. The staff are very reliable and many are already serving their 5th year working at the resort, (Junis,Liz, Jenny and others). Anyone wishing to swim with the whale sharks take the advice of the staff and be there early (like 7.00am) to avoid the crowds..and also try to make it a week day, not weekend. Eden offers an excellent shuttle. The only flaw this time around was that the phone number for Eden printed on the Ago booking confirmation, was wrong. It caused distress as I was stranded in Dumaguete believing the ferry was cancelled due to a typhoon. I had to search for an internet cafe in Dumaguete and search for the web page to find another phone number. As it turned out the typhoon cancelled ferries the day before. I have asked the staff to chase up Agoda. I have stayed at Eden now 3 times and would not keep returning if it was not the best accommodation in the area. The staff are geared up for butanding, ie whalesharks and also for local tourism eg: waterfalls The view verlooking the water between negros and Cebu is wonderful of course, but their best feature to me is the total support for the whaleshark swims at Oslob. Room is very comfortable and great view. Location not very near to Whale Shark but can take tricycle for 200peso. Food is OK. No other food stall around the hotel. Room was large and spacious. Bathroom was spacious too. They strictly charge for extra person and max is 3 persons per room. The bus from the city passes by the hotel so it is accessible (4 hours from the city by bus). Food was delicious but a bit pricey. I recommend the pizza, sinigang, calamari and bacon set(breakfast). 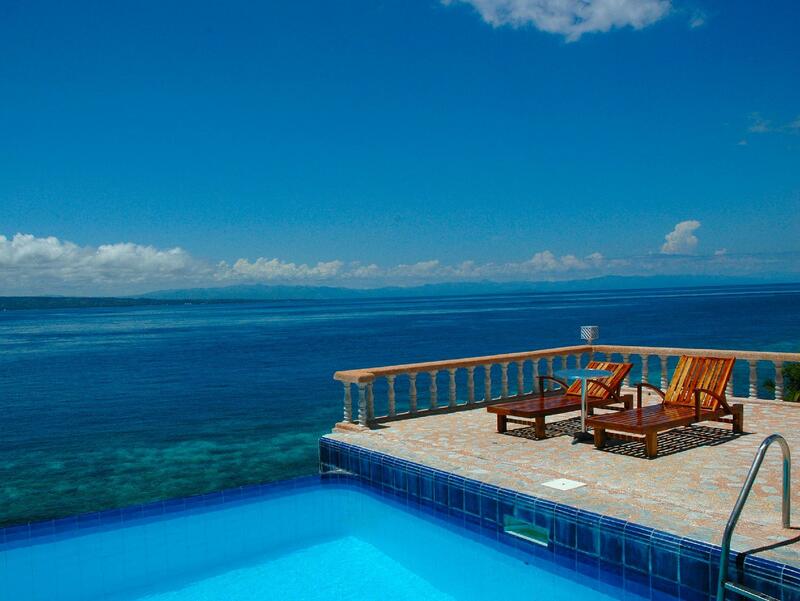 They also charge 500 per room for transportation service to Oslob (whale shark watching). I just hope this could be free since you are checked in the hotel. 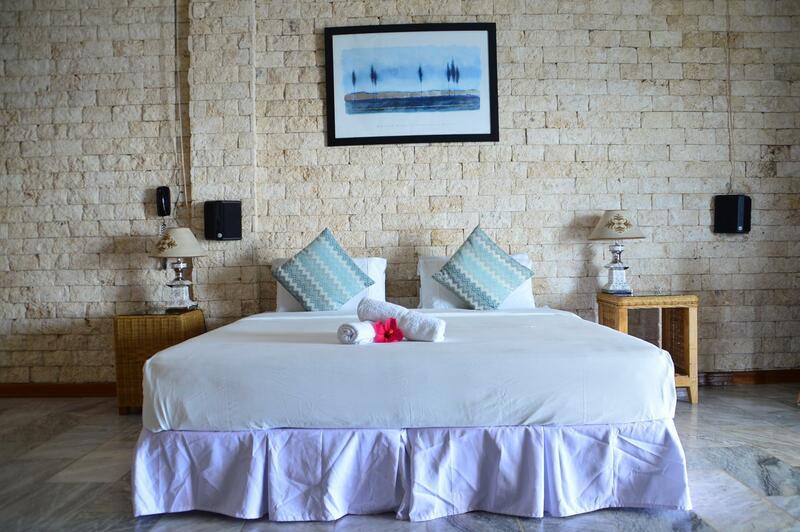 You can stay in this hotel if you're planning to go to the whale shark site in the morning. Take the 6:30am trip. The infinity pool was nice and had a great view; there is also a small jacuzzi. But the shore was full of rocks and corals so you can't swim in the beach but the rooms' view is amazing (ocean, mountain, sunset). Quiet and peaceful, perfect place for us to destress and forget our concerns. Staff were friendly and courteous. Rooms and facilities are clean. Restaurant servea good food. Location is easy to find. It'd be better if you have your pool developed since your beach is only good for scuba diving or snorkeling; not really sandy, especially not good for kids since it's slimy due to the algaes. It might cause accidents. Staffs were friendly and pool have awesome seaview with mountain. Room is clean and you might get to watch stars during nighttime. Hotel is near to Oslob and Liloan port. Room is clean and staffs are friendly. They even gave us a free ride to Liloan port and free shower for us after our visit to Oslob. Highly recommended. We chose to stay here as part of our trip to Oslob because this resort is far superior to any of the others in Oslob itself. 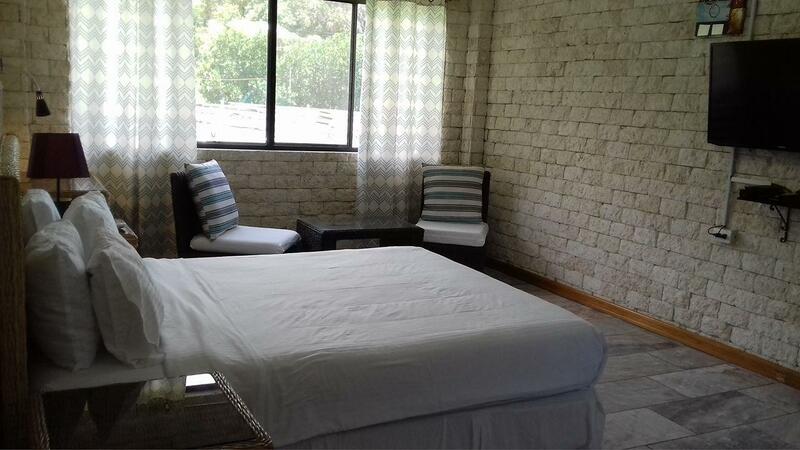 The place and facilities are very beautiful and suitable for couples. We use the stairs to get into the beach and did snorkeling for several hours. the pool is great. The breakfast wasn't satisfactory. The thing that really upset me was the staff agreed to let me check out at 2pm and the next day they sent two people to make me check out at 12 noon because people were coming in. The sun was very strong and they dont have aircon in the guest area. I was burnt and sweaty and asked for a temp room just to cool off because there'd be 2 hours before we will leave but they weren't accomodating.